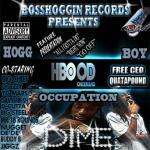 Sign up for Broadjam today to follow Lil Dime/Bosshoggin Records, and be notified when they upload new stuff or update their news! I am an Inspiring artist from Charleston South Carolina and I have been doing music for about thirteen years. I currently have three mixtapes out online and in stores and I am currently working on my newest project. You can also check my music out on youtube. Bosshoggin Records was established by CEO QuataPound and I take in part the MGT and Production process.